Back in the day there were just two options, slotted or Phillips. You picked one, picked a length, and were good to go. But the fastener market has made huge strides over the last few decades, giving DIYers better solutions for keeping stuff together. In the days when a screwdriver was the primary means of inserting screws, the Phillips was king. But now, with most of us using cordless drill/drivers to drive screws—or even dedicated Lithium Ion pocket drivers (which are awesome, by the way), the hardware has developed to prevent bit slippage and stripping of the metal. The Quadrex is a combination of square (Robertson) and Phillips head screws. It provides a great deal of surface area and allows lots of torque to be applied; a great option for driving-intense options like framing or building a deck. Torx or star drive heads provide lots of power transfer between the driver and screw and are a great option when many screws are needed, as they provide minimum wear to bits. They are, interestingly, often referred to as “security fasteners,” as they’re the choice of schools, correctional facilities, and public buildings, as well as automotive and electronic manufacturing, where the ability to remove hardware needs to be discouraged. Interesting, right? 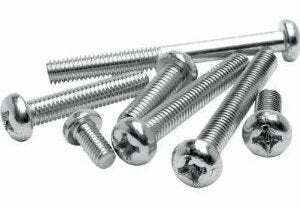 Sheet metal or panhead screws are useful, when the fastener does not need to be flush with the material (countersunk). Since the head is wider and the thread extends the entire length (no shank), this type of screw head is excellent for joining wood to other materials, metal included. Here the biggest question is whether the screw is for indoor or outdoor use? Indoors, you can use less expensive zinc screws or the material/coating can be selected for visual appeal. 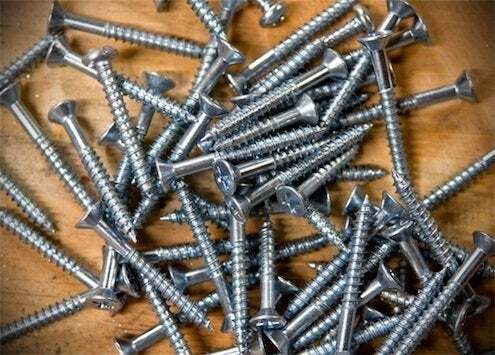 But outdoor screws need protection against corrosion from moisture and temperature change. The best outdoor solutions are silicon-coated bronze or stainless steel. The most important factor in screw selection is length. The general rule of thumb is that the screw should enter at least half the thickness of the bottom material, e.g. 3/4″ into a 2 x 4. The other factor is the screw’s diameter, or gauge. Screws come in gauges 2 through 16. Most of the time you’ll want to go with a #8 screw. If working with very thick or heavy material, go for #12-14, or with finer woodworking, #6 are often the best choice.